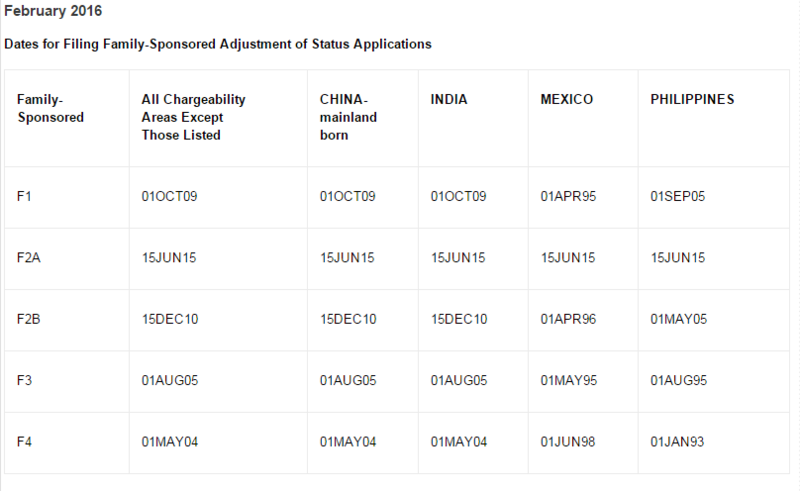 Starting with the just-released February Visa bulletin, USCIS is now publishing its own distinct version of the priority date charts at USCIS.gov. Unlike the Department of State’s visa bulletin charts, which list both “Filing” and “Final Action” priority dates for each category, the USCIS version will only list whichever priority date is being used to determine filing eligibility that month. This will simply the monthly process of checking priority date cutoffs for adjustment applicants who are here in the U.S.,* who can now check one website to learn which priority date is relevant for their chargeability category. For February, USCIS will continue to accept family-based adjustment applications using the “Filing” cutoff dates. Remarkably, not a single family-based chargeability category saw any movement this month in either direction (chart via USCIS.gov, click to enlarge). Neither USCIS nor DOS provided forward guidance for any category, but we will continue to provide monthly updates here. *Foreign nationals applying for immigrant visas through a U.S. Consulate abroad should continue to consult the Department of State’s monthly visa bulletin update, which is typically available a few days earlier than the USCIS version.